Twitter’s search engine kicks. There was a collective cheer in the Twittersphere when Summize was brought into the Twitter family. It’s the fabric for hashtags and any other trend unfolding in our lives. Capturing such phenomena on a news web site can be a powerful way to show how news unfolds. At the Austin American-Statesman, we’ve had a couple of occasions to use the jQuery plugin Juitter to pull Twitter search results onto our sites, most recently for our Swine Flu news aggregation site. It is an easy and quick way for a developer to display the power of a Twitter search in real time. Juitter developer Rodrigo Fante has decent enough instructions on how to use Juitter on his site, but I did make some modifications for one project to show a Tweet’s @username and icon together, and to remove the superfulous “Read it on Twitter” link. You can see an example here, and download the system.js and jquery.juitter.js files that power have the changes. As it became clear over the weekend that the swine flu was becoming a major national and international story, Statesman VP for Internet Tim Lott went hunting for domain names. The Statesman has been wanting to try to build a nimble niche aggregation site for a while as an experiment, and the swine flu seemed like a good topic for a test. On Monday, Lott instructed one of our developers to build a niche site using an CMS outside of the main newspaper’s site. 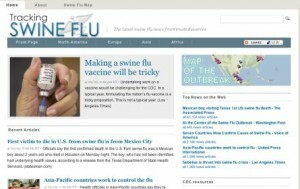 By lunchtime Tuesday, our swine flu information site was live. It’s a full aggregation site, with a national and international focus. Everything links off the site except for the “About” page and a page for a Google mashup. Aggregation is hand-picked by an editor (me), who is scouring the Web for interesting flu-related stories from trusted sources. Our hook is that you can trust what I’m choosing to be reliable. We also added several resource links and a Twitter stream from Juitter. 1. We wanted to build this quickly. Obviously, if we waited too long, we’d miss the opportunity. 2. The CMS we used for the niche site (WordPress) is nimble and flexible. Our newspaper’s site is not as flexible. 3. We wanted it to be divorced from our site as much as possible. It’s from the Statesman, but we don’t want it to be the Statesman. This is an experiment, but it’s fun, challenging and, hopefully, useful for readers. A couple of weeks ago, I wrote about the need for journalists and bloggers to be active participants on their own comment boards. If you were going to create the ideal set of rules for a newspaper comment board, something that your readers — hopefully — would abide by, what would you include? We’re talking about story-level comments, blog comments and forum remarks. How would you enforce the rules? Where would you post them?